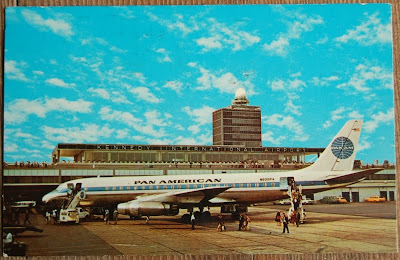 A Pan American Jet Clipper arriving at International Airport from the magic world of travel. Provenance: Sent 7/11/68, 2:15 p.m. Gift of the Morgan F. Shirley Collection, 2009. There's no such thing as a boring postcard with an airplane on it. I would restate that as "boring postcards with airplanes on them are especially awesome."